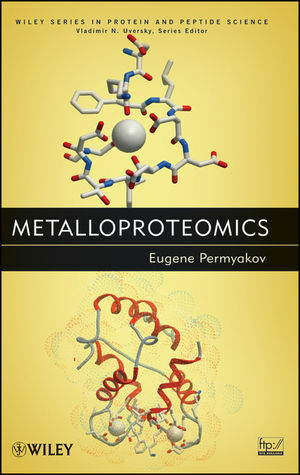 Metalloproteomics is the large-scale study of metal-binding proteins. These proteins, which represent about one quarter of all the proteins in the Protein Data Bank, play important roles in all biological systems and all biological processes. Metalloproteomics provides the latest information on all major families of metal-binding proteins, including their structural, physico-chemical, and functional properties, enabling readers to better understand these proteins. Moreover, the book demonstrates how understanding the structures, properties, and functions of intracellular and extracellular metal-binding proteins may unlock the key to drug development for the treatment of a myriad of diseases. Throughout the text, the author integrates principles of proteomics. In addition, detailed examples underscore the role metal-binding proteins play in health and medicine. Bringing together and analyzing all the latest findings, Metalloproteomics' scope and level of insight are unparalleled. It is recommended for biophysicists, biochemists, enzymologists, cell and molecular biologists, protein and peptide scientists, organic and bioinorganic chemists, and chemical biologists. EUGENE PERMYAKOV, PhD, Doctor of Sciences, Professor of Biophysics, has been the Director of the Institute for Biological Instrumentation of the Russian Academy of Sciences since 1994. His research focuses on the study of physico-chemical and functional properties of metal-binding proteins, with an emphasis on calcium-binding proteins. 1 Complexes of Metal Cations and Low-Molecular-Mass Compounds and of Metal Cations and Proteins. 1.1. Biologically Significant Metal Cations. 1.2. Structures and Properties of the Complexes of Metal Cations and Low-Molecular-Mass Compounds. 1.3. Dissociation Constants for Complexes of Metal Cations and Low-Molecular-Mass Compounds. 1.4. Solubilities of Complexes of Calcium and of Some Other Metal Cations. 2 General Regularities of the Binding of Metal Cations to Proteins. 2.1. The Structures of the Protein-Binding Sites of Calcium, Magnesium, Zinc, and Transition Metal Ions. 2.2. Binding Stoichiometry and Binding (Dissociation) Constants. 3 Experimental Methods Used for Studies of the Binding of Metal Cations. 3.1. Atomic Flame Absorption Spectroscopy. 3.5. Equilibrium and Flow Dialysis. 3.11. Circular Dichroism and Optical Rotatory Dispersion Spectroscopy. 3.13. Extended X-ray Absorption Fine Structure Spectroscopy. 4 Calcium, Calcium-Binding Proteins, and Their Major Families. 4.1.2. Calbindin D9k, D28k, and Calretinin. 4.1.6. Recoverin and Other Neuronal Calcium Sensor Proteins. 4.1.7. Calcium-Regulated Photoproteins (Aequorin, Obelin). 4.1.9. Penta-EF-hand Family of Ca2+-Binding Proteins. 4.1.10. Sarcoplasmic Calcium-Binding Protein and Calerythrin. 4.2. Other Cytosolic Proteins That May be Calcium Modulated. 4.2.3. &alpha;-Lactalbumin and Calcium-Binding Lysozymes. 4.3.3. Serum Amyloid P Component. 5 Interactions of Calcium-Binding Proteins with Low-Molecular-Mass Compounds, Peptides, Proteins, and Membranes. 5.1. Interactions with Low-Molecular-Mass Compounds. 5.2. Interactions with Peptides and Proteins. 5.3. Interactions with Membrane Systems. 6 Calcium-Binding Proteins in Various Systems. 6.1. Calcium-Binding Proteins in Muscles. 6.2. Calcium-Binding Proteins in Nervous System. 6.3. Participation of Calcium-Binding Proteins in Blood Coagulation Process. 6.4. Participation of Calcium-Binding Proteins in the Calcification of Hard Tissues. 6.5. Cytotoxic Activity of Calcium-Binding Proteins. 6.6. Calcium-Binding Proteins in Bacteria. 7 The Binding of Magnesium Ions to Proteins. 8 The Binding of Zinc Ions to Proteins. 8.1.2. Zinc-Binding Sites, Containing His and Asp/Glu. 8.4. Protein Interface Zinc-Binding Sites. 8.4.1. Protein Interface Catalytic Zinc-Binding Sites. 8.4.2. Zinc-Binding Sites in Superantigens. 8.4.3. Zinc-His/Glu Sites at Protein Interfaces. 8.4.4. Zinc-Cys Protein Interface Sites. 8.5. The Binding of Zinc Ions to Calcium-Binding Proteins. 8.6. Some General Notes on Zinc-Binding Sites. 8.7. Zinc Ions in Cells. 9 The Binding of Copper Ions to Proteins. 9.4. Copper Transport and Anticopper Protection. 9.5. Interactions of Copper with Prion Proteins. 9.6. Alzheimer’s and Parkinson’s Diseases and Metal Cations. 9.7. Wilson’s Disease, Menkes Syndrome, and Copper Ions. 10.4. The Proteins with Fe–S Clusters. 11 Molybdenum-Containing and Tungsten-Containing Proteins. 11.4. Aldehyde : Ferredoxin Oxidoreductase and Formaldehyde : Ferredoxin Oxidoreductase. 12 Proteins Containing Nickel and Cobalt. 13.1. Manganese in the Photosynthetic Systems. 14 Sodium-Binding and Potassium-Binding Proteins. 14.3. The Mammalian Naþ/Hþ Exchanger. 14.5. Enzymes Activated by Monovalent Cations. 14.5.1. K+-Activated Type I Enzymes. 14.5.2. K+-Activated Type II Enzymes. 14.5.3. Na+-Activated Type I Enzymes. 14.5.4. Na+-Activated Type II Enzymes. 15 Interactions of Metal Cations with Nucleic Acids. 15.1. Interactions of Metal Cations with DNA. 15.2. Interactions of Metal Cations with RNA. 16.3.3. Lanthanum (La) and Lanthanides. 16.3.4. Actinium (Ac) and Actinides. 16.4. Metals and Metalloids in the Groups 13 to 16.